All these documents are providing important insights into the way the A.B.N.G. was created and evolved throughout the years. This article examines in which context the association was founded and what its original aims were. It shows that the A.B.N.G. quickly rethought the scope of its activities, until nervously disabled veterans became a marginal category among its beneficiaries. Consequently, this paper also tries to explain why the original project of the A.B.N.G. finally phased out. Many associations dedicated to wounded soldiers appeared in France during the Great War. It was not rare that an association was dedicated to the assistance of a particular category of ill or injured veterans such as blind or tubercular soldiers, or amputees. But before 1917, no one took specific care of the soldiers who suffered from psychological troubles. To retrace the birth of the A.B.N.G., a close examination of the association's articles is necessary. These articles begin with the list of the association's members. It is interesting to note that Marguerite Hérold, though she was the founder of the A.B.N.G., is presented as a simple member of the association. It was her husband, André-Ferdinand Hérold, who chaired the Board. She probably wanted to put her association under the patronage of a man with political connections and influence. André-Ferdinand Hérold did indeed come from a distinguished family. His father was the secretary of the Government of French Defense in 187012, and became a senator in 1876, and the prefect of the Département de la Seine in 1879. André-Ferdinand was himself a man of letters, a theatre critic and one of the creators of the newspaper L'Européen. He was also the vice-president of the League of Human Rights from 1913 to the end of his life in 1940. Conversely, Marguerite Hérold was born into a rather modest family: according to her birth certificate her father was a farmer and her mother worked as a seamstress.13 Her marriage with André-Ferdinand Hérold helped her to climb the social ladder. Once she had entered the Hérold family, she took a central place within the important social network gravitating around her husband, composed of famous artists, academics, politicians and industrialists. Naturally, she solicited this network to support her association. Therefore, eminent figures are listed as members: people such as Anatole France or Ernest Lavisse from the Académie Française, Edouard Herriot, senator and mayor of Lyon, or Léon Bonnat, director of the Paris School of Fine Arts. The names of Edith Wharton and Mildred Wood Bliss, two women who took part in other charities during the war, also appear in the list, reminding us that the founding of A.B.N.G. is embedded into the specific context of a burst of charity work provoked by the war. For women from wealthy families, involving themselves in these kinds of associations was only a logical extension of the philanthropic activities they traditionally supported in times of peace. In the list of the A.B.N.G. members, two other names require special consideration, those of Justin Godart and Louis Mourier, who both served as Undersecretary of State for War in charge of the armed forces' medical service. The attention of Justin Godart had been drawn to the plight of soldiers with nervous troubles in September 1916: the Société de Neurologie de Paris appealed to him by expressing their wish that special establishments should be opened to take care of nervously disabled men unable to support themselves, and who were a significant burden for their families.14 No sources allow us to establish a direct connection between this initiative from the Société de Neurologie de Paris and the founding of the A.B.N.G. Nevertheless, the fact that Justin Godart took part in the founding process might indicate that these were not two separate events. Furthermore, a close reading of the arguments underpinning the wish expressed by the Société de Neurologie de Paris, on the one hand, and in the call for donations included in the articles of the A.B.N.G. on the other, shows a large overlap. The call for donations provides us with a better understanding of the goals of the association. Its mission was twofold: to offer medical care to nervously disabled veterans, and to facilitate their reintegration into society. To complete this task, the association intended to open agricultural centres and workshops throughout the national territory where the men could train for a job without being separated from their families. This confirms that already in 1917 the A.B.N.G. was designed to continue its action after the war. It seems to have been successful; yet there was not enough money to carry out the original, ambitious project. During the war, far from being able to create centres around the country, the A.B.N.G. could only rely on a small location in Paris where offices and an examination room were installed. Due to this lack of space, it is very likely that the number of veterans taken in by the association was very small during the war. It was only after the armistice that the A.B.N.G. seems to have developed properly and begun to fulfill its goals on a larger scale. Due to its advertising brochure published in 1921, we know that the association moved to new premises: a dispensary was opened in the 18th arrondissement of Paris where veterans were provided with medical care. According to the brochure, veterans and their families could see a doctor twice a week, and three times a week they had the possibility to eat there and do some work with the aim of training for a new job. Moreover, the dispensary was considered as a place where the veterans could find comfort and encouragement, and this moral support was intended for their spouses, too. Finally, the association wanted to help veterans to claim their rights, especially when a pension had been denied to them. In addition to the dispensary, the association now had a reeducation home where veterans could stay when it was not possible for them to remain living alone or with their families. This reeducation home was settled in a castle bought by Marguerite Hérold and located at Arnouville-lès-Gonnesse, in the north suburb of Paris. The castle was in the heart of a huge park measuring twenty-five hectares. It could accommodate 150 residents who could practice horticulture, basketwork or farming. The castle also had facilities for hydrotherapy treatments and, according to the brochure, a doctor was living there to take care of the veterans at any time. Beyond what can be concluded from the advertising brochure, it is difficult to make out how the association really worked. In order to find out how many veterans were received at the dispensary or at the reeducation home, we can only rely on a few General Assembly reports.15 According to them, the number of men who frequented the dispensary each year between 1923 and 1926 fluctuated from 1.798 to 2.078; and 30.000 to 40.000 meal tickets were provided. Most of the veterans who came to the A.B.N.G. where seeking moral and financial help, rather than medical care. Indeed, since the number of medical examinations at the dispensary varied in the same period from 636 to 700, it is obvious that not every veteran was asking for a doctor. But these data show that the activity of the dispensary was maintained at a fairly high level until 1926. This was not the case for the reeducation home, where the numbers of residents reduced over the years. In 1923, there was a monthly average of 93 veterans living in the castle, only 73 in 1925, and 45 in 1928. The reeducation home, which was supposed to receive 150 veterans, never functioned at its full capacity. Given that situation, the association decided to expand the scope of its activities to the care of "unstable and retarded" children. In 1924, in addition to the castle, the association opened a new establishment in Limours, exclusively reserved for younger children – from three to fourteen years old. In 1927, one of the castle's wings was dedicated to children from fourteen to eighteen years old. Little by little, this new category of residents increased, and in 1929, the few veterans who were still living in the castle were moved into another place in Gonesse. In 1930, around 40 veterans were living there, according to an inspection report presented to the prefect.16 Even if the association never changed its name, its original purpose had been phased out. Why did the A.B.N.G. face so much difficulty in finding nervously disabled veterans who would stay in its reeducation home? It was certainly because the association dedicated itself to a very imprecise category of potential beneficiaries, composed of very different medical cases. For many of them, the model of the reeducation home proved to be not suitable at all. The end of the reeducation home: a medical failure? What exactly was a nervously disabled veteran? This was a thorny issue. The expression "blessés nerveux" might lead us to believe that the association intended to take care of veterans with neurologic diseases. But this would be a mistake for at least two reasons. As said in the introduction, at that time the frontier between psychiatric and neurologic disorders was permanently called into question. Moreover, the term “nervous” was often used to avoid other words considered as stigmatizing, such as "psychiatric" for example. In the advertising brochure published in 1921, the A.B.N.G. claimed its intention to take care of veterans who suffered from concussion or mental confusion or who had endured trepanation. The association became gradually aware of the ambiguity of these diagnoses. For all these reasons, the castle of Arnouville-lès-Gonesse finally failed to accommodate those who could have benefited from its services, that is to say the veterans who were unable to live by themselves but did not come under institutionalization. The purpose of the A.B.N.G. was to apply the same methods and solutions to nervously disabled men as to other categories of wounded veterans. 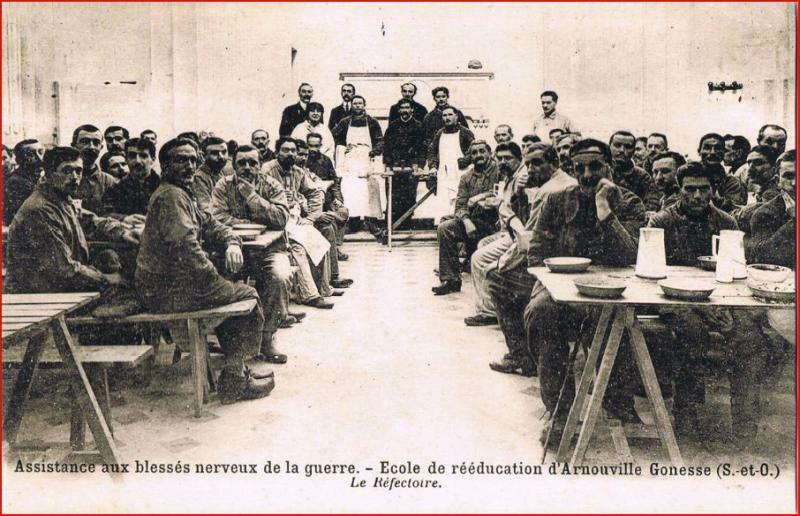 Just like the ordinary reeducation schools which multiplied in France after the First World War, the reeducation home installed in Arnouville-lès-Gonesse was supposed to be a place where veterans could learn how to manage with their disability and how to make a living despite of it. Their stay was thought to be temporary. The idea was to facilitate the transition between war and the return to civilian life by making sure that the veterans would be able to find jobs in order to support themselves. But the basic premise of A.B.N.G. proved wrong because it was based on a misunderstanding: taking care of psychological war trauma was not equivalent to handling physical damages. It only took the association a few years to realize that the dispensary could be sufficient only for those who suffered from mild disorders. For the others the reeducation home was not a realistic alternative to asylum. In most cases, institutionalization indeed remained the only answer to severe psychological suffering. 1. Etat des malades et blessés ayant reçu des soins neuropsychiatriques, Archives du Service de Santé aux Armées, carton 572. This evaluation concerns every military region of France except for the 19th, 20th and 21st. – The website's editors are grateful for Jennifer Laing's support in preparing this text for publication. 2. Etat des malades et blessés ayant reçu des soins neuropsychiatriques, Archives du Service de Santé aux Armées, carton 572. This evaluation concerns every military region of France except for the 19th, 20th and 21st. – The website's editors are grateful for Jennifer Laing's support in preparing this text for publication. 3. During the inter-war period, at least two other associations were created in order to help veterans suffering from mental disorders: L'Aide aux Mutilés du Cerveau founded by Georges Cuvier in 1930 and L'Association nationale des familles et amis des aliénés de guerre, founded in 1929 by René Poudevigne. They were essentially dedicated to those who were institutionalized. 4. The history of the A.B.N.G. is evoked in the last pages of Guillemain / Tison, Du front à l'asile 2013. 5. This other association is called L'Entraide Universitaire. 6. L'Assistance aux blessés nerveux de la guerre : œuvre autorisée par arrêté ministériel du 20 octobre 1917. Statuts, Paris 1917. 7. 'Assistance aux blessés nerveux de la guerre, Paris 1921. 8. Wallon, Henri, "Les réactions motrices dans les crises dues à l'émotion". L'année psychologique, vol. 22, Paris 1920, pp. 143-166. 9. The archives of the French National Office for Veterans and Victims of War are kept at the French National Archives in Pierrefitte-sur-Seine. 10. 19800035/645/74416, File of Marguerite Marie Hérold, French National Archives. 11. Agnès and Jean-Jacques Vidal created an association dedicated to the history of Arnouville-lès-Gonesse. They own some postcards showing the A.B.N.G. reeducation home. I thank them for their kind help. 12. The Government of National Defense was the first government of the Third Republic in France. 13. Marguerite Hérold's birth certificate is included in her file as a member of the Legion of Honour. 14. Vœu de la Société de neurologie de Paris, séance du 7 décembre 1916, Revue neurologique, Paris 1916, pp. 593-595. 15. L'Assistance aux blessés nerveux de la guerre. Compte rendu de l'Assemblée générale du 24 juin 1926, Paris 1926. This General Assembly report is kept at the Bibliothèque de Documentation Internationale Contemporaine. The General Assembly reports of 1924, 1927 and 1928 can be found in the archives of the National Office for Veterans. 16. The report can be found in the archives of the National Office for Veterans and Victims of War, at the National Archives in Pierrefitte-sur-Seine, under file number 20050206 54. 17. Forest, L., "a paix par les fleurs", Le Matin, March 11, 1922. 18. "Thé-concert au profit de l'Assistance aux Blessés Nerveux de la Guerre", Le Petit Parisien, December 23, 1922. 19. The report can be found among the archives of the National Office for Veterans and Victims of War, at the National Archives in Pierrefitte-sur-Seine, under file number 20050206 54. 20. L'Assistance aux blessés nerveux de la guerre. Compte rendu de l'Assemblée générale du 23 mars 1924, Paris 1924 (Archives of the National Office for Veterans and Victims of War, at the National Archives in Pierrefitte-sur-Seine, file number 20050206 54). 21. Wallon, Henri, "Les réactions motrices dans les crises dues à l'émotion", L'année psychologique, vol. 22, Paris 1920, p. 157. 23. Medical file of Hippolyte T., Centre hospitalier Le Vinatier. 24. L'Assistance aux blessés nerveux de la guerre. Compte rendu de l'Assemblée générale du 23 mars 1924, Paris 1924 (Archives of the National Office for Veterans and Victims of War, at the National Archives in Pierrefitte-sur-Seine, file number 20050206 54).